Fringe is over, but Forum’s Marat/Sade has two more weekends left in its run. Reviewed for DCist . . . more than a week ago. I’m a bit behind in my blogkeeping. Coupla a serviceable new releases from emerging artists this week. Details. How many things cost only one-third more now than they did seven years ago? Concert tickets, following their stratospheric mid-90s leap (another reason to hate Don Henley) may actually have leveled out in the first part of the 21st century. 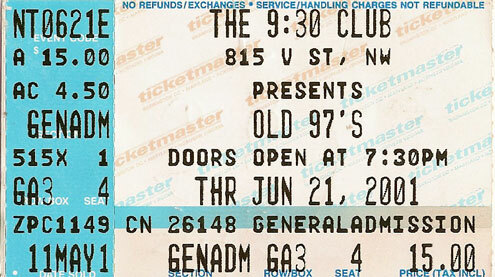 When the Old 97s play the 9:30 next week, they’ll be charging only $5 more face than they did back in 2001. (Good seats still available, incredibly.) These guys have kids and mortgages! How can they do that? Here’s my review of their reassuring latest, Blame It on Gravity, from today’s Weekend section. I haven’t been able to find it on the Paper of Record’s web site anywhere except for right here. Natascia Diaz and Doug Kreeger in Rooms: A Rock Romance. Photo by Colin Hovde. Ever wonder how an original musical gets written? A: Very slowly. And now I’m writing about theatre for the Paper of Record. How the hell did I miss this? Stuever’s one of my favorite scribes at the Paper of Record, and The Joker is, of course, the scariest killer in fiction. Decent essay — Stuever’s are never less — but he misses that people said the same thing about Tim Burton’s 1989 Batman that he’s saying about Chris Nolan’s 2008 The Dark Knight: That the villain is more interesting than the hero. Well, yeah, Hank: The villain is always more interesting than the hero. A smart salesman, that O’Neil. When it finally hit the comic book shop to which I faithfully pedaled a sweaty mile, several times a week, Roger (the rat-tailed manager who was exactly like Comic Book guy on The Simpsons, only disgustingly skinny instead of corpulent) slapped a “PG-18” sticker on it, which made it like an R-rated movie, only you couldn’t buy a ticket for something else and then sneak in. Your parents, could however, sign an index card granting you permission to buy PG-18 comics (mostly the DC fantasy/horror books like Swamp Thing and, a year or so later, Sandman; the kind of stuff that in the 90s would comprise DC’s Vertigo line. I’m pretty sure this store didn’t carry anything that might approach any legal standard of obscene, though probably a lot of parents would have called Love & Rockets that.) Incredibly, my dad accompanied me to the store at my urging so I could buy The Killing Joke. (Later — somewhat incredibly, he even signed one of those index cards.) It was the first comic I ever saw where the bad guy actually seemed evil, and his acts horrifying and irreversible. I’m going to have another look at The Killing Joke tonight, before I see The Dark Knight on Thursday. Can. Not. Wait.